In the summer 1975, a young family moved to Davis from Southern California to open a small bicycle store at 703 2nd Street. The 800 sq ft storefront employed Frank and his three sons: Jeff, Eric and Kevin. In the late 70's, steel frame road bikes were popular, and Freewheeler sold hundreds of Univega and Nishiki 10 speed bikes in those early years. In the 1980's, the store became one of the earliest dealers for Giant Bicycles, just as they were getting a start in the US bike market. Today, they are one of the biggest bike companies globally. 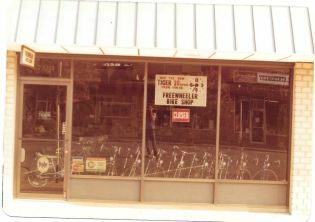 The store continued to grow and eventually expanded to the storefront's on either side of the original location. In the mid 90's, Freewheeler partnered with Trek Bicycles, out of Madison, WI. Trek would go on to become the number one bicycle brand in the US, and continues to revolutionize carbon bicycle technology across the market. In the early 2000's, Jeff's daughter joined the work force, followed by her brother. Today, three generations of the family can be found in the shop every day of the week (occasionally helped by the fourth generation). Together, the knowledge and expertise we have earned allows us to give each of our customers the highest quality of service. We don't just sell bikes-we are proud to be members of the community. You're likely to find us riding our bikes around town, at swim meets, soccer games, and fundraisers. Our family has grown up on bikes. We've towed our toddlers, taken the training wheels off, conducted school bike rodeos and supported racing development teams. We've seen first hand how biking makes our community stronger, makes those who ride healthier and happier, and reawakens our sense of contentedness. We have solutions because we believe in bikes. Wherever your bike takes you, we are honored to be your bike shop.